Using a mobile phone while driving reduces the amount of attention you’re paying to the road environment and, as a consequence, increases crash risk. This is true even when using hands-free technology as concentrating on answering and the conversation that takes place affects your driving. To reduce the risk for everyone, there are laws that both limit and prohibit the use of mobile phones while driving in Queensland. These rules vary based on the licence you hold. People under 25 who hold a learner or provisional P1 licence are subject to a ban on all mobile phone use. This ban includes hands-free, wireless headsets and loudspeaker functions. In addition to the ban on you as a driver, your supervising driver and any other passengers travelling with you are also banned from using the loudspeaker function on their phones. Supervising drivers and passengers are permitted to use a phone in their hand, hands-free and with a wireless headset (just not on loud speaker). These rules also apply to P1 probationary and P1 restricted licence holders of all ages whose licence classification has been affected by previous offences. This category includes learners and provisional P1 licence holders over 25, and provisional p2 and open licence holders. Drivers within this category are banned from using a phone held in the hand. This is true even while stopped in traffic (at lights or while congested). These drivers are however allowed to use hands-free, wireless headsets and loudspeaker functions. If found guilty of the offences outlined above, you can be fined $353 and have 3 demerit points applied to your traffic history. 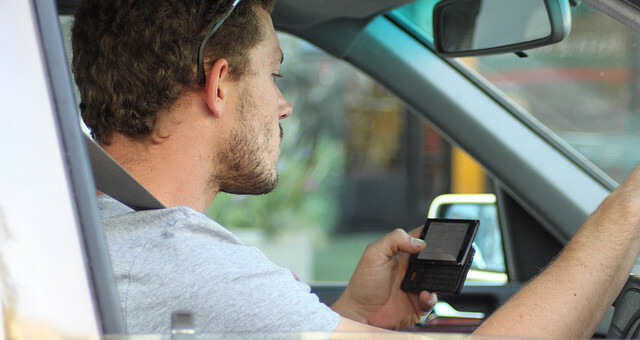 From 1 September 2015, the Queensland government introduced a double demerit penalty for second or subsequent mobile phone offences if the second or subsequent offences occurs within 1 year of a previous offence - so repeat offenders are severely punished. Some people find it hard to ignore their phone while driving. Here are some good techniques to avoid distraction (and mobile phone offences). An easy way to prevent breaking the rules is simply to turn off your phone while driving. This means you won't be tempted to touch it. An alternative is to place the phone out of sight (and therefore out of mind). The glovebox and console are two options you could try out. Installing a hands-free kit (when legally allowed to use one) will allow you to answer calls with minimal distraction. Remember that your main focus should be on driving and if you find the required multi-tasking problematic, you should go back to turning your phone off and/or hiding it. Any hands-free installation mounted on the windscreen should be placed to ensure your view of the road is not affected. If your view is obscured, change the mount placement. Your last option is to wait until you're parked to use any function of your phone. All phone use is legal for all licence holders of any age while legally parked, so just wait until you're parked to respond to calls or messages. Remember that although you may be happy to increase your own crash risk by using a mobile phone, doing so increases the risk of injury and death to other road users who are not happy to assume more risk than they’re already taking on by participating in the inherently dangerous task of driving. Increasing this risk for those around you is unfair and the consequences of mobile phone use while driving could irreparably damage your life. People using mobile phones while driving are easy to spot (you’ve probably noticed people yourself). This act is irresponsible but more importantly illegal. Just think, if you’ve seen people doing it, it’s easy for the police to do the same. Watch the video below to see just how easy it is to be caught using your mobile phone while driving.